As I rest there, I feel an acceptance and love I cannot ever remember feeling. I feel a weight released a new freedom from something that had been holding me back, though I am not sure what it was. “Is this what it will be like when we are finished?” I cannot help be ask. I am quiet, afraid. Already this has been so difficult. I am not sure. “I don’t know if I can do this…” I try to hold back the tears which threaten now. “I will be here when you are ready. There is no pressure, now. I will wait on you. It is all right. Your eyes are tired from the tears. Go wash in the pool.” He points toward the water nearby. I obey. The water is cool and refreshing. I had not realized how dry and irritated my eyes were. As I wash, I see His feet. I am overwhelmed by the beauty of His feet as they have walked beside me, even carried me. I turn back to him and fall at His feet, remembering the woman with the perfume. 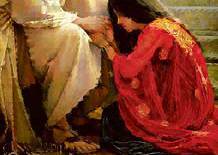 I long to anoint His feet, as she did, but I have nothing! I have nothing worthy to offer Him! My heart breaks again. “One is the cry of your heart, the other the cry of your flesh,” He explains my conflict so clearly. Tenderly, He lifts my head, kissing my forehead, completely accepting what I was trying to pour out to Him! I am amazed at His total acceptance of what very little I have offered to Him, in such imperfection! “Come walk to a deeper place with me.” He invites, not demands, as He lifts me to my feet. He takes my arm gently, yet without hesitation. We walk toward a part of the garden I had not seen before. I find myself at peace, smiling. Suddenly, He is there, taking my arm again. The relief in His presence is physical, washing over me like a wave. I am crying though. “Help me! I don’t want to go back to this. I thought it was gone. !” I am angry with myself. “It takes time for the habits to die.” His patience seems unwavering. He nods, smiling I think. “Do we need to go back to the grove, to the tree?” I ask, dreading the thought of the long walk there and the anticipation of His correction. “I am afraid.” I whisper, not really knowing why I am saying that. Surely He knows. “Take my arm; hold on to Me, I will give you strength.” He bids me, still no anger in His voice. I obey and He begins. I see how I am still functioning in the old ways—anticipating and reacting out of rejection; ready to demand my rights and not to trust. Not trusting Him nor anyone else. I do not trust Him to take care of me, I am trying to fight my own way through. I weep and cry out, “Forgive me, Father!” He is done. It hurts, once again. How do I do this? This is what I know—how do I change? Hopelessness wells up within me, threatening to overtake me. I am surprised by what He has just said. “That was you? I heard no voice?” I am confused. “Your heart heard as you flesh could not. You subdued your flesh when you bid Me come to you.” He gently explains; it sounds almost as though I have done something right. I think this is going to take me a while to understand completely. I rest against his arm until I am strong enough to stand.